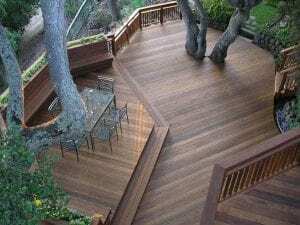 Deckstainhelp.com is your go-to source for deck staining tips and trends on the internet in 2019. Read below for insights about the science of deck stains and why more pigment in deck stain means better UV protection. Leave us a comment below if you have experienced this yourself. Pigments are used for coloring and tinting wood stain. Most pigments used in stain manufacturing are dry powders that are ground up. The powder is added to a binder that suspends the pigment, which gives the stain its desired tint. Stain pigments can vary in color depending on the type of light they are reflecting. For exterior wood surfaces that light source is typically sunlight. But pigments also play an important role in protecting the wood from the sun’s harmful UV rays. The pigment reflects the sun’s radiation, this is why more pigment means better UV protection. In general, the more pigment a stain has the more UV protection it provides. Stains can be specially formulated to not only give a beautiful appearance but also to help reflect UV rays even more. Synthetic pigments and nanoparticle technology combined with heavy resins, binders, and other fillers can offer superb UV protection. Welcome to Deckstainhelp.com, your source for industry insights and trends for the perfect deck stain project execution. 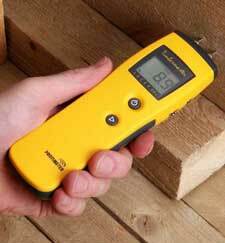 See below for information on the ideal temperature range for deck stain application. We want to hear from you. Leave us a comment if you have input about the ideal temperature range for deck stain application below. There is no uncertainty that weather has a huge impact on applying a deck stain. A number of factors can help or hurt when it comes to staining a deck. Rain for one is a very big factor. Not only can rain delay and deck staining project, it can also ruin a freshly stained deck if it rains before the stain has time to dry. But there is another factor that may not be as common. The temperature range for applying deck stain is just as crucial. Although the suggested temperature ranges for applying deck stain gives a lot more room for error, it can still come into play. Applying deck stain when temperatures are too cold can affect the curing process of the stain. Applying deck stain when temperatures are too hot can cause the stain to evaporate and dry too quickly. In both cases, the stain’s performance can be jeopardized. 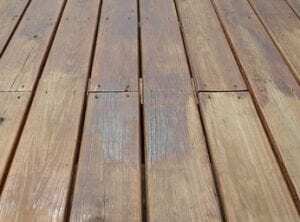 DeckStainHelp.com remains the Internet’s go-to site for all things exterior wood surface restoration related. Below we explain why darker color deck stains will last longer, so if you are looking for a long-lasting stain, choose a darker color. We encourage customer interaction on our site, so feel free to leave us a comment below. The lifetime of a deck stain is determined by several different factors. Weather, climate, sun exposure, and foot traffic are some of the main factors that will determine the longevity of a deck stain. Out of these main key factors, sun exposure is probably one of the most damaging elements to a stain’s integrity. Harmful UV rays can break down the protecting elements of a wood stain in a season or two. Most deck stains provide water protection but not all of them will provide UV protection. When exterior wood is exposed to the sun it becomes discolored and faded. 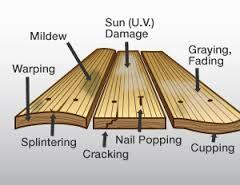 The top layer of wood fibers turns gray as they are damaged by harmful UV radiation. One key element in the fight against sun damage can be the amount of pigment found in the stain. Color pigments will act like sunscreen and provide a certain amount of sun protection.